BMW X5 Series is a mid-size luxury crossover Sports Utility Vehicle (SUV). The car is a perfect combination of luxury and spaciousness. Modern technology, style and performance are the highlights of the car. The car is surely going to carve a niche for itself in the Indian car market. Appearance: BMW X5 Series comes in various beautiful colors – Alpine White, Titanium Silver, Platinum Bronze, Silver Grey, Black Sapphire and Monaco Blue. The frontage consists of double kidney shaped front grille, broad headlights, body colored bumper and integrated fog lights. The rear side comprises of beautiful taillights. Comfort: BMW X5 Series consists of many comfort features. The car has spacious interior and a number of storage options. BMW X5 Series consists of Automatic Climate Control, Automatic Air conditioning and Recirculation Control. The central console comes with armrest and storage compartment. Cup holders are provided in the rear seat armrest. Other comfort features include height adjustable driver’s seat, leather wrapped power steering wheel and comfortable leather seats. Safety: BMW X5 Series is one of the safest SUVs in India. The standard safety features consist of Alarm System, Central Locking System, Steering Column Crash System, Force Limiters, Seat Belt Pretensioners and Airbag package. The car is fitted with X-drive system and Dynamic Stability Control (DSC) sensors. Engine: BMW X5 Series comes in two variants. The 4.8i model has 4.8 L V8 petrol engine. The 8 cylinder petrol engine produces a power of 261kW at 6250 rpm and a torque of 475 Nm at 3400-3800 rpm. The 3.0d model consists of 3.0L I-6 diesel engine. The 6 cylinder diesel engine churns a power of 160 kW at 4000 rpm and a maximum torque of 480 Nm at 1750 rpm. Both the engines are linked to 6 speed transmission system. Price: The price of 2 models of BMW X5 Series is described below (taking Mumbai as base price location). BMW X5 3.0d – Rs.62,50,000. 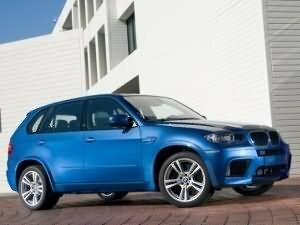 BMW X5 4.8i – Rs.76,60,000. However, the prices specified are approximate prices only which exclude tax, registration, insurance and cost of accessories.